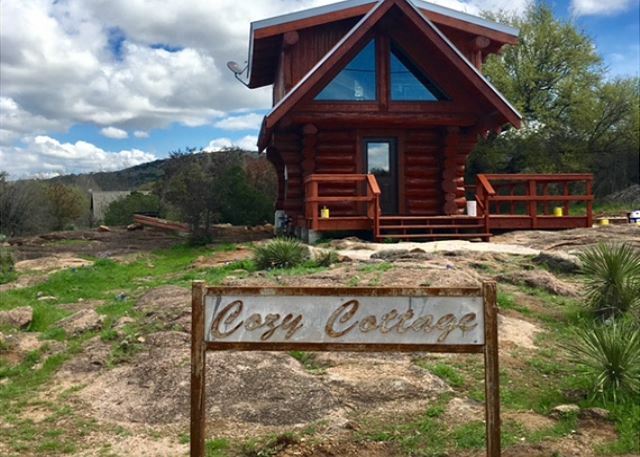 This cozy little efficiency cabin is perfect for a quiet, romantic getaway or honeymoon. 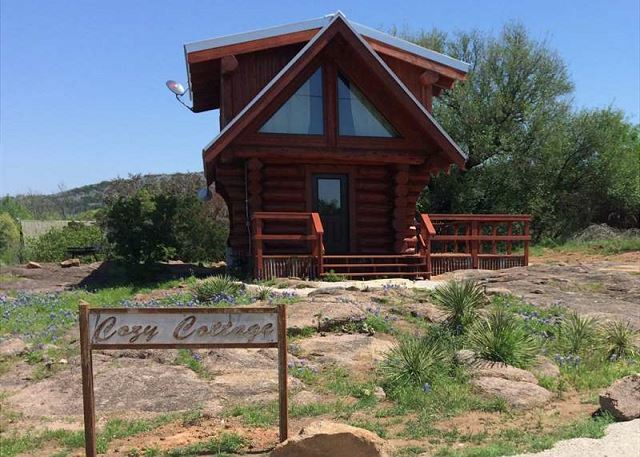 Cozy Cottage is tucked away in an area surrounded with natural granite and beautiful views of the Texas Hill Country. 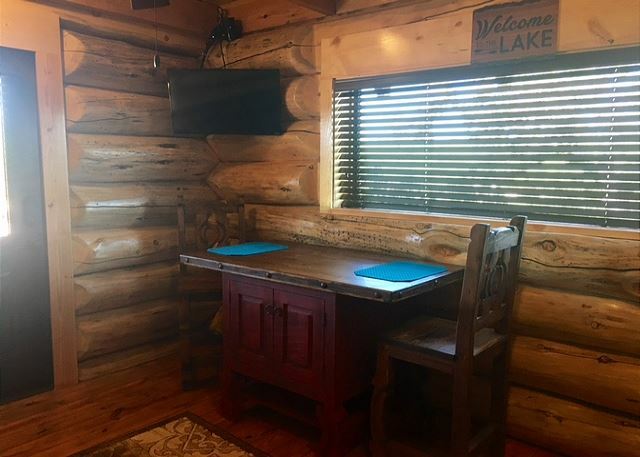 The log cabin is fully furnished with a King size bed in the loft, a Keurig Coffee maker, microwave, mini refrigerator, 2 flat screen TV’s (one in living room area and the other in loft). 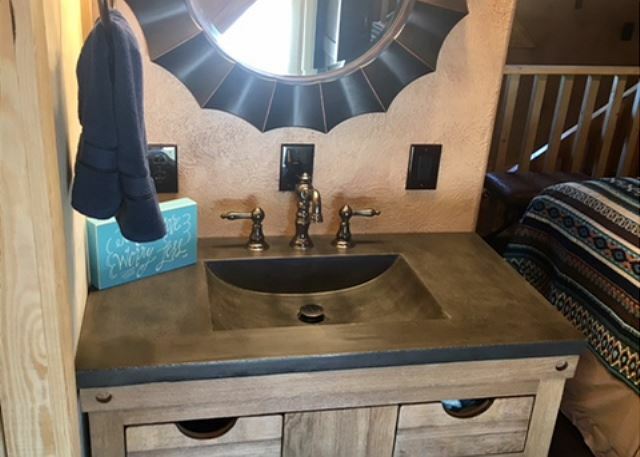 The home has DirectTV and wireless internet. It is located in the ideal place for attending a wedding or event in Cedar Skies. You are only a few hundred yards from the common area of Log Country Cove. This common area is between the office and Lake LBJ. Sand volleyball is sure to catch your interest whether a player or a fan. Picnic tables and chairs are scattered about on the grassy area and patio. The ever-popular rope swing in the roped off swimming area of Lake LBJ is the site of excited children (both young and old) anticipating what will happen as they hang onto the rope and push off the ground. The hoops and hollers as they hit the water has others waiting in line for this attraction. During the summer months a water trampoline is placed in the water for Log Country Cove guests. Jumping, diving and climbing are great fun and exercise to boot. At the end of a full day you can relax on the Sunset Pier and take in the beauty of sun setting over the waters of Lake LJB. The Saraya Trail is just around the corner from Cozy Cottage. Hiking on this trail lends itself to much enjoyment. You may see some wildlife including beautiful birds and are sure to discover nature at its best no matter the season. 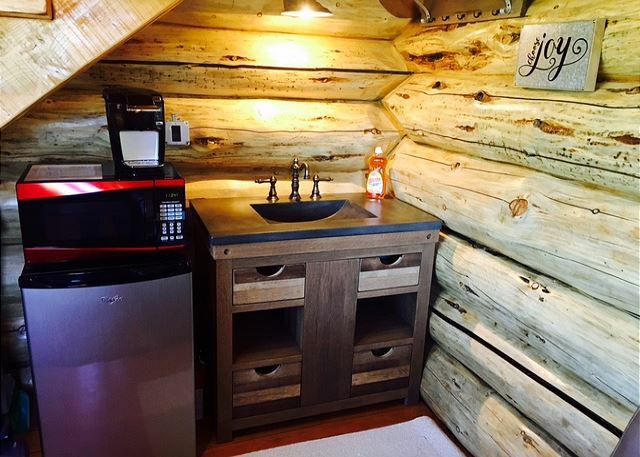 This cute little cabin is sure to lure you back to Log Country Cove and all the fun that is available. 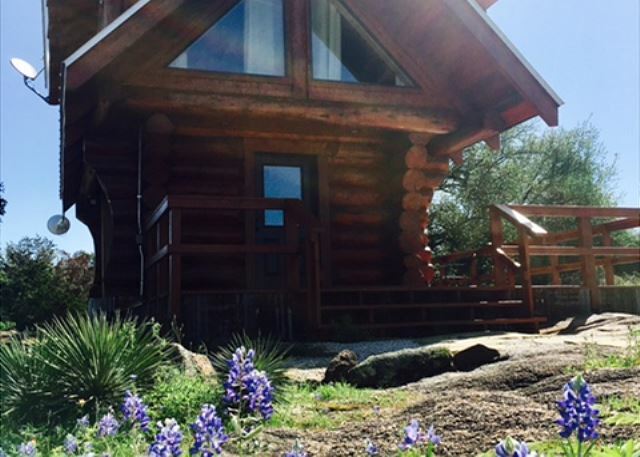 Rooms Sleeps 2, Efficiency Log Cabin - sleeps 2; has a King bed in loft with TV and bath. Ground floor has small living, dining area with mini-fridge, microwave and a sink. There is also a tv on the ground floor. A charcoal BBQ grill is provided for outdoor cooking. The time spent here was delightful and relaxing. The walks were enjoyable and the river was beautiful to watch. We even enjoyed the swings! We will certainly return! Mary: We are so happy that you enjoyed your stay in the Cozy Cottage. We hope to see you all back again with us very soon. The Cozy Cottage was so relaxing and the upstairs warm and cozy. 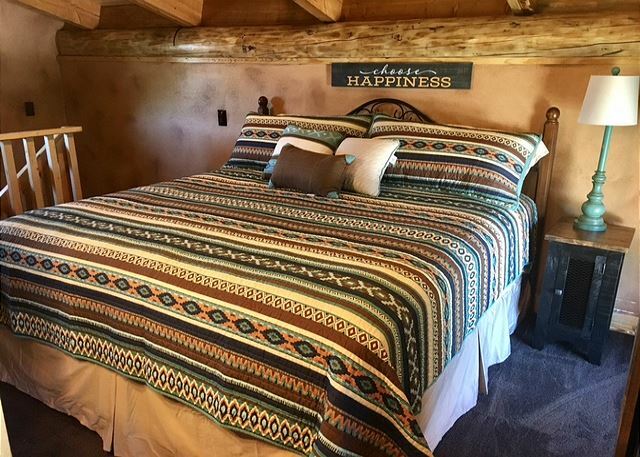 We slept well in the bed and reenergized for walking on the trails of the property. The hills and creeks nice because of the previous rains. The views and lake sunset was relaxing after a game of putt putt. Great vacation! It was a great place to stay! My girlfriend thought it was absolutely adorable. We will definitely return for another visit. It was extremely clean and efficent, considering the small size. Enjoyed the fire ring. Need to provide your own coffee. Need to specify this, because some of us have to have coffee in the morning. 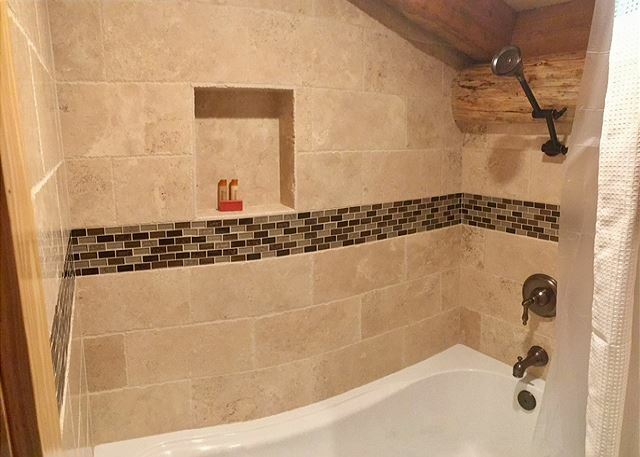 We are so very happy that you enjoyed your stay in our Cozy Cottage. We so hope to have you back as our guest in the future.